Save Money Growing Food ~In Small Spaces and Patios too! Whether you have a huge backyard with lots of space for a garden, or a small deck with just a limited amount of space, you can save money growing food. The other week I shared how we make a small garden work for us. How we make sure to plant things like tomatoes, green beans, cabbage, and other plants that don’t take up a lot of room but still produce nicely. Disclaimer: This post contains affiliate links which help support this site at no cost to you. I wanted to break that down into how gardening saves us money. We manage to fit 16+ plants in a small section of our garden. From those plants I can enough of the following to make it through the year. We don’t like raw peppers, but love them in recipes. So we grow a few hot peppers for the salsa, and the rest are Bells. I freeze them for recipes. I both can and freeze our green beans. Generally we run out of at least one or the other by the time the next year rolls around. However, I never buy canned green beans and only rarely buy the frozen kind. I usually have to buy strawberries to supplement what we grow. However, I freeze many of our strawberries for wintertime smoothies, and other strawberry deserts. As well I make strawberry freezer jam. I have no way of knowing how much I save by making freezer jam. But it’s the best! There is no way of knowing how much we save by growing the rest of the stuff we grow, since we don’t have enough room to grow more than we can eat. However, I know our overall grocery bill is an average of $50 less a month while our garden is producing. Saved an average of $150 a summer. The totals listed here add up to a whooping $446! There is no way for that to be an accurate figure though. I used all sale prices for my store quotes, and there is no way to compare the quality of home-grown foods to store-bought. In addition of course, are expenses to gardening. 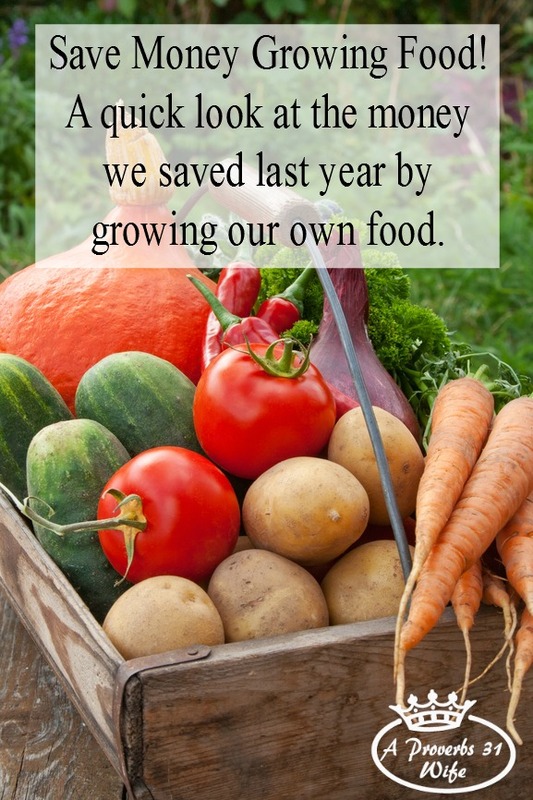 Our expenses are pretty low, but we still have them, all the same, we definitely save money growing food. Even if I couldn’t grow more than what we would eat, I would still have a garden. The benefits are huge, even if the savings cannot be that big. Want to Learn More about Preserving Foods? Check out my recently published e-book that walks you through the basics of freezing, canning and dehydrating. Learn which method is best for your family and how to get started. It’s possible to save money growing food when patio gardening too. It’s a new trend called container gardening. We actually container garden a bit as well. The chart below is a great help on deciding what to grow. As well, vertical gardening can really help you make the best use of your space. You could try a Topsy Turvy Tomato planter. We had one and it definitely worked! And this 5 Tiered Planter can be set on the patio or hung. I can just imagine how pretty it would be all filled with strawberries! Even if you can only plant a small area and cannot really save money growing food, I would still suggest that you grow what you can. Gardening is very calming, helps you feel closer to your creator and is a wonderful experience for children! Very informative post on gardening! Thanks this very encouraging. This is our first real attempt at growing our own food. I really do hope to save money on our grocery bill. I do feel a sense of peace when I am out in the garden. I have a 3 year plan to grow food year round for our family and to help the local shelters, YAHUAH willing. Sounds great!!!! Once you start you won’t ever want to go back to store bought foods! How do you freeze your bell peppers? I don’t can anything from my garden yet as i’m still learning how. However in the last few years I have been freezing a lot of veggies. Thank you for telling me how!